Guglielmo Marconi was born in 1874 into a wealthy family in Bologna, Italy, and educated by private tutors. He developed an interest in science, particularly the work of German physicist Heinrich Hertz on the transmission of electromagnetic waves through the air. Though he failed the entrance exam at the University of Bologna, Marconi began experimenting with wireless telegraphy on his own in 1894. He discovered that by connecting his transmitter and receiver to the earth (grounding them), and then increasing the height of the antenna, he could extend the range of the signal. Despite this important technical breakthrough, the Italian government declined to sponsor his work. Marconi began experimenting with wireless telegraphy on his own in 1894. From J.A. Cochrane, The Story of Newfoundland (Montreal: Ginn and Company, 1938) 210. Telegraph companies still all but monopolized the transmission of messages through their systems of cables, but the potential of wireless telegraphy to ships at sea was apparent. The Royal Navy, which for centuries had relied on signal flags and lights to communicate between ships at sea, equipped three warships with Marconi sets in 1899. Privately-owned commercial ships soon followed. Marconi demonstrated the effectiveness of the system in coastal waters by sending a wireless message across the English Channel to France. It remained unclear how far a radio wave could travel. Many scientists understood that a radio wave, as with the part of the electromagnetic spectrum we see as light, travels only in a straight line from the point at which it was produced. They doubted whether radio waves could bend around the curvature of the earth and thus be received over the horizon. Marconi believed that radio waves would follow the earth's curvature, making communication to ships at sea feasible, and designed an experiment to prove his contention. If successful, the experiment would also provide a "stunt" that would give the relatively new technology, and Marconi's company, world-wide publicity. This was to be the transmission of a wireless message across the Atlantic. Marconi constructed a transmitter at Poldhu, Cornwall, in the west of England and another at Cape Cod in Massachusetts. 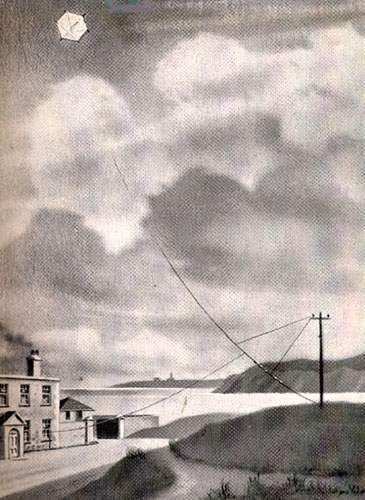 When a storm damaged the Poldhu antenna, and it had to be replaced by a smaller one, Marconi decided to change the North American destination to St. John's Newfoundland. In any event, the Cape Cod station was itself destroyed in a storm. In December 1901 Marconi assembled his receiver at Signal Hill, St. John's, nearly the closest point to Europe in North America. He set up his receiving apparatus in an abandoned hospital that straddled the cliff facing Europe on the top of Signal Hill. After unsuccessful attempts to keep an antenna aloft with balloons and kites, because of the high winds, he eventually managed to raise an antenna with a kite for a short period of time for each of a few days. Accounts vary, but Marconi's notes indicate that the transatlantic message was received via this antenna. A drawing of the kite aerial used at Signal Hill for reception of the first transatlantic wireless signal, 12th December 1901. Artist unknown. From Marconi Company, Marconi Jubilee 1897-1947 (Chelmsford, England: Marconi's Wireless Telegraph Company Limited, 1947) 17. At the appointed time each day his staff in Poldhu transmitted the Morse code letter "s" - three dots. This signal had been chosen as the most easily distinguished. On the 12 December Marconi pressed his ear to the telephone headset of his rudimentary receiver and successfully heard "pip, pip, pip" - slightly more than 2100 miles from the transmitter. This demonstrated that transatlantic wireless communication was possible. While "ground waves" followed the curvature of the earth for only a short distance over the horizon, "sky waves" also bounced off the ionosphere in the upper atmosphere and returned to earth, which although unknown at the time, had allowed Marconi to demonstrate that radio communication over great distances was possible. Marconi at Signal Hill with instruments used to receive the first transatlantic signals. From Marconi Company, Marconi Jubilee 1897-1947 (Chelmsford, England: Marconi's Wireless Telegraph Company Limited, 1947) 18. Through the cables of the telegraph companies, the news of Marconi's feat spread throughout North America and Europe. The potential of wireless telegraphy was immediately apparent, and Newfoundlanders seized the potential for their country, which could be at the forefront of a new industry. Marconi was interested in the commercial potential of wireless telegraphy, and the Newfoundland government encouraged him to construct a wireless station at Cape Spear, the easternmost point in Newfoundland and Labrador. But the new technology faced resistance from those who owned the transatlantic telegraph cables. The telegraph industry had invested a great deal of money in laying cables, and did not intend to allow a competitor to enter the business without a fight. In 1854 the Newfoundland government had granted Anglo-American Telegraph Company a 50 year monopoly upon telegraphic communication, in exchange for their laying a cable from St. John's to the island's west coast and across the Cabot Strait to the rest of North America. The terms of the act included a guarantee no other company would establish facilities in the colony for telegraphic communication though wires or any other means. This did not expire until 1904. 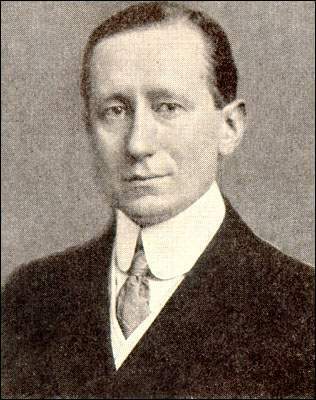 Marconi knew of the monopoly, and to avoid Anglo-American blocking his experiment he deceived the press as to his real purpose in Newfoundland, claiming that he was experimentally communicating with ships at sea. This deception also avoided embarrassment if the attempt failed. Within days of Marconi's successful reception of the first signal, lawyers for Anglo-American served notice that they would sue for damages if Marconi persisted in receiving telegraphic messages in Newfoundland. Marconi immediately replied that even before hearing from Anglo-American's lawyers he had decided against establishing a wireless telegraphy station in Newfoundland, and promised to cease his experimentation. As a result, Marconi could not repeat the transmission for the many government officials and excited members of the public who wanted to see a demonstration for themselves. They were treated to a lecture on the theory of wireless transmission, and a demonstration of how an apparatus could ring a bell at one end of the room by an operator pressing a switch at the other end. Whether Marconi intended to establish a wireless telegraphy station in Newfoundland before Anglo-American threatened to sue for damages is unclear. The Newfoundland government and public were excited by the possibility that he would. The local newspapers bristled with letters objecting to Anglo-American's position, but public opinion mattered little. Regardless of Marconi's earlier intentions, when faced with the possibility of a protracted legal battle with a well-financed commercial rival, or having to delay the construction of his station for three years, he left Newfoundland to find another site. Sensing an opportunity, the Canadian government was quick to offer Marconi a suitable site for one of his wireless telegraphy stations, and he soon constructed his station at Glace Bay on Cape Breton Island, where no legal monopoly over telegraphy existed. The difficulties with the Anglo-American Telegraph Company were not the end of Marconi's association with Newfoundland. 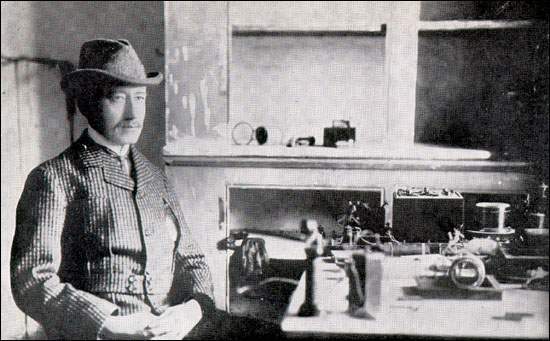 He returned to the island in 1904 to install a wireless station at Cape Race, the station that was later to receive the SOS message from the Titanic in 1912, and in 1920 he was on Signal Hill to test a long-range transmitter and receiver. In another dramatic stunt, the SS Victorian sailed from England toward Newfoundland to see at what distance the wireless transmission of the human voice could be distinguished. Initial contact occurred when the ship was about 1200 miles from St. John's, and reception improved as the ship became closer. Marconi continued to experiment with long-wave and short-wave transmission as well as to manage his business interests until his death in 1937. His work, and that of other scientists and inventors, had revolutionized communications at sea and on land and had created whole new industries, such as radio broadcasting. Marconi's patents and investments made him wealthy and his scientific achievements led to his sharing the Nobel Prize for Physics in 1909. But he is primarily remembered for his reception of the first wireless signal across the Atlantic Ocean at Signal Hill.